Hi, I am interested in your 1967 Chevrolet Chevelle SS (stock #4679-CHA) listed on Autotrader for $32,995. I'd like to get more information about this vehicle and confirm its availability. A bright red hardtop with all the right trimmings will first attract you to this 1967 Chevrolet Chevelle SS tribute. But as you take time to look over all the details from the fresh bucket seat interior to the detailed 283 V8 youll discover a classic style with all the right investments. 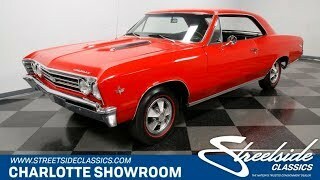 Start with that red paint a bold color thats always popular with Chevelle fans. Its quite fresh and has that level of luster that will make you proud to drive this one sunny days. The way this shines, it highlights the quality sheet metal underneath. That way you see all your favorite parts of this iconic design, like the creased hood, kick-up in the fenders, and the flying buttresses C-pillars. As good as the paint is, the trim is equally nice, with form-fitting bright chrome bumpers, full-width grille, and polished stainless details. This Super Sport tribute really gets those details right, too. You see it in the dual power bulge hood with bright vents, correct badging, and ribbed rocker panels. It even has the SS wheel covers with proper redline tires to give this an aggressive and well-coordinated total presentation. The interior is more of exactly what you want correct pieces and quality investments. For example, the trim code 761 shows this was born a black interior, but now you can tell there was money spent upgrading this to be fresher and more comfortable. That means the premium feeling of crisp insignia trim bucket seats and a center console w/clock in-between. Plus, the door panels, carpets, and headliner have that kind of fresh black appearance that makes us believe there was a nice investment here, too. Youll slip behind the three-spoke wood and chrome steering wheel, and this gives you a commanding view of the extra-wide factory speedometer. Everything looks thoughtfully appropriate from the AM radio thats still on display, to the tach mounted in the correct location. Even the trunk looks great with details like the jacking decal still affixed. When you pop the hood, you realize that they really spent time making the engine bay look terrific. The show-worthy presentation has smooth black fender walls, tidy wires, bold block paint, and even factory-style markings. They didnt miss a detail right down to the GM hoses and glass washer bottle. And of course, all that shine. The air topper, booster, valve covers are all part of a nicely polished package. More than just look great, this 283 fires up readily and idles smoothly. Plus, the Powerglide automatic transmission, power steering, and power brakes keep this smooth hardtop an easy cruiser. Complete with owners manual, this is the kind of iconic pillar-less hardtop classic thats always in demand. So since youre not the only one who wants it, you might want to hurry up and call today!